What’s the importance of function for the quality of a building in terms of architectonics? What’s the significance of function when architecture and towns are created? And to what extent are the theory and practice of function part of the basics of architecture? In addition to topics such as space and material, the third Aachen-based conference on Architecture’s Identity is all about function. As a basic parameter, the conference will examine its impact both on the design and the building of architecture and towns. The list of the speakers invited, who will present their work or their standpoint with regard to the overarching theme of the two-day event, includes over 30 renowned firms. Some of them are, for instance, Bruno Fioretti Marquez, Mäckler Architekten, Fink + Jocher, Kollhoff Architekten, Atelier Kempe Thill, HG Merz, Monadnock, Lederer Ragnarsdottir Oei, Thomas Kröger and Müller Reimann. Viennese architect Hermann Czech will hold the keynote speech. This year, the symposium will take place on 24 and 25 January. Wilkhahn will be sponsoring the series of events again as a partner from industry. The cost will be €90 per day for full payers, with discounted tickets for students and members of RWTH Aachen University. In addition to the admission ticket, the price also includes food and beverages. The NRW Chamber of Architects will recognise four hours of each day of the event as training. To find out about what else Wilkhahn is up to in terms of architecture, click here. 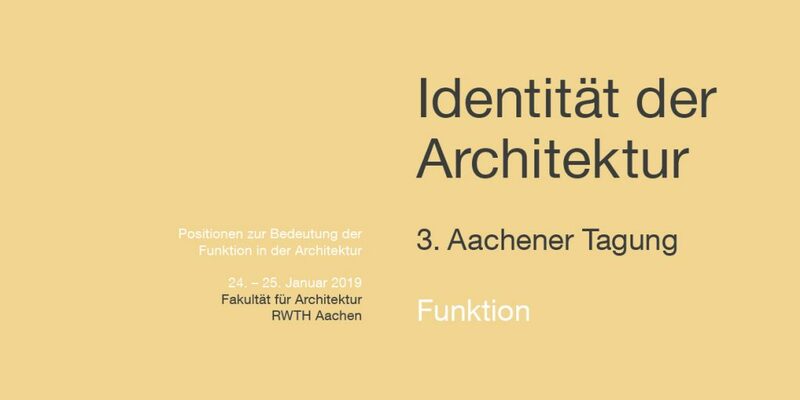 Read our report on the 1st RWTH conference on Architecture’s Identity.